Ruins of a mountain fortress dated to the Hellenistic period, which was probably built to protect the border between the west (Acre/Ptolemais) and center of the Galilee (Sepphoris). Khirbet Tefen (Kal'at e-Tufaniye) is located on a steep hill near Kishor. On top of the hill are the ruins of a mountain fortress dated to the Hellenistic period and may have been a Hasmonean border fortress. According to archaeological ceramics survey, the fortress was also in use through the Byzantine, Crusaders and the Mamlukes periods. 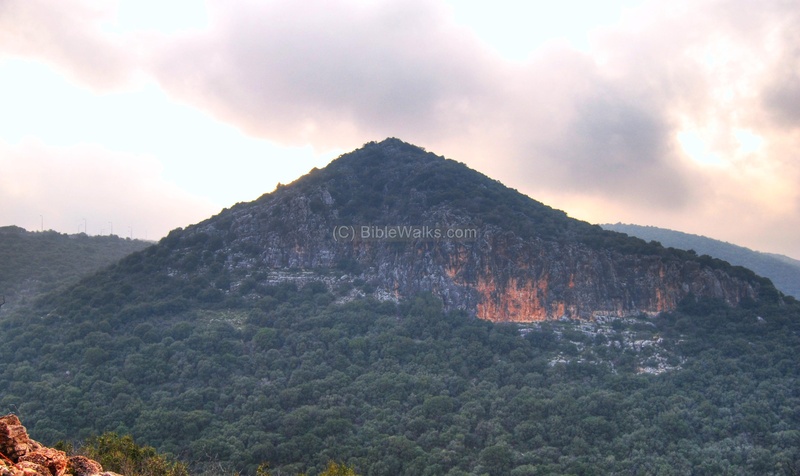 It rises high over the north and east side - the hill reaches the height of 535M, while the gorge of Beit Haemek brook under the hill is 370M. On the narrow hill top are defensive walls and towers. 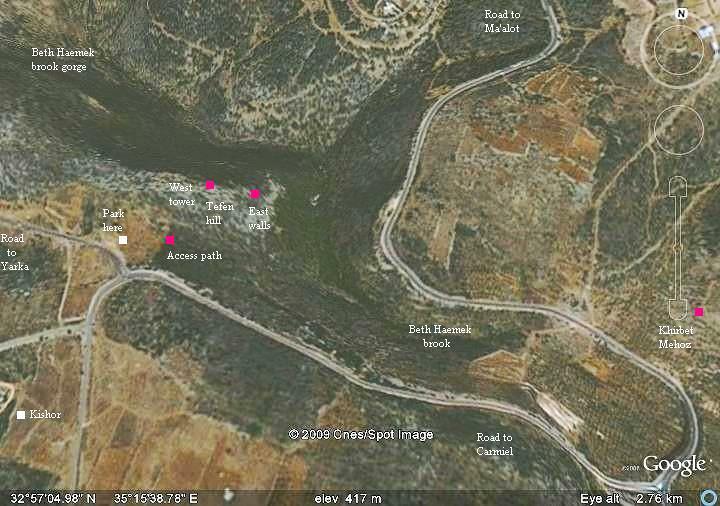 The site of Khirbet Tefen is located above the deep valley of the brook called Beit Haemek ("house of the valley"), which flows down to the Mediterranean sea near Shavey Zion. A junction of the modern road (#854) to Ma'alot, Kishor, Yarka and Carmiel is located nearby, where you can park the car. You can point on the purple points to navigate to the selected section. The fortress was built during the Hellenistic period, during the 2nd C BC. The purpose of the fortress is unknown for sure, but it is likely that the fortress was built to protect the borders between the west Galilee (administered by Acre/Ptolemais) and center of the Galilee (administered by Sepphoris). The fortress was either built by the Phoenicians or by the Hasmonean Kings. According to an article (R. Frankel 1989), the scholars suggested that fortress may have been constructed in order to protect the flanks of Acre-Ptolemais. The fortress was later held by the Hasmonean Kingdom as part of the border protection. Note that the Galilee was added to the Hasmonean Kingdom in 104-103BC by Judah Aristobulus I, and the border passed at this area and to the east until the Jordan river. The Galilee was under Jewish control for 40 years until Pompeius conquered Israel in 63BC. The area of the fortress continued to be a border area of Roman Judea until the end of the Byzantine period. During the Roman/Byzantine period the fortress served another purpose of protecting the new villages around it - Mehoz and Heshek (on its east side) and other villages on its south side. During the Crusaders period the fortress was part of their defense line. The fortress was still in use until the Mamlukes period. Modern period: In 1980 a new Kibbutz - Kishor - was established 1KM south-west of Khirbet Tefen. It was the first Jewish settlement in the area of Tefen. The name was derived from the nearby Arab-Druze village of Kissra, which is located on a hill called Kishor. An aerial view from the southwest side of Tefen was captured by our quad copter drone. The ruins of the fortress are located on the summit of this steep hill. The access path ascends the south side of the hill. Across the deep gorge, on the hidden side, is Moshav Lapitod, which is accessed by road #854 seen on the right side. The road then continues to the industrial zone of Tefen, seen on the far left side. The photo below shows a ground view from the north. The steep hill on the north side is about 160M above the gorge, and thus did not require defense walls on this side - they were required only on the other three sides. Caution - when standing on top of the hill, be careful not to trip down into the abyss. You can park on the south side, near the junction and on the side road to Yarka. Then walk up the path that is marked with white-green-white mark, as seen below. This path is on the south-east side. The path reaches to the base of an impressive gate which is located on the south side of the fortress. You can enter here or continue the path to the eastern walls. Notice the large blocks that were used to construct the wall around the gate, which were quarried out from the rocks on top of the hill. The top of the hill is the center of the fortress, and a quarry where the building blocks were extracted is located on the western side. The cavity in the center served as a water reservoir. In the central background of the photo is the western tower. A closer look on the water reservoir from the south side where a small pool is cut into the rock. Behind it is the larger water reservoir which was the main water supply for the fortress; the water was probably fetched from that reservoir to the small pool. The western tower is part of the defense walls that protected the south and west flanks of the hill. A closer view of the corner of the tower is seen below. This is the south-eastern entrance to the tower. A view of the south side is seen below. The parking lot is near the road. The access path and the south gate is just below this point. Another view from the western tower - towards the east. You can see how narrow is the top of the fortress. The south-eastern side is protected by a low wall that stretches along the ridge. In the background, covered by a cloud, is the road to Ma'alot (on the left) and Carmiel (on the right). Another section of the south-eastern walls is seen below. The view, on a sunny day, is worth the climbing. You can include a short 1/2 hour visit to the fortress while visiting the Byzantine/Crusaders villages nearby (Mehoz and Heshek). Tefen - based on the Arab name of the area - Tufaniye, meaning flood or downpour. Kal'at - Arabic: citadel, fortress. Article in Hebrew from Cathedra #73 1994: Ancient Olive oil production in the Galilee, with reference to R. Frenkel & N. Gezzuv 1989 "Tefen fortress"